Robe is the perfect gift for any girl who loves horses. 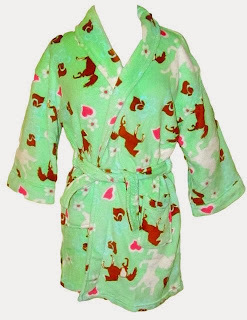 Knowing what their customers were looking for to thrill the horse lovers in their lives, GirlsHorseClothes.com designed this pretty, plush, horse print bathrobe - in plenty of time for holiday shopping. The pistachio green background, chestnut brown and white horses, and dark pink and aqua accents were chosen to appeal to girls and women of all ages. "The print and colors are not too young, and not too old" said the store's owner. Their soft, plush robes are available in girl's sizes 4-16 and women's one size fits most, ONLY at GirlsHorseClothes.com. The independent online store also offers coordinating slippers and plenty of other horse themed clothing and gifts. They also offer personal service - they'll help with gift selection & sizing advice, and love to ship directly to your gift recipient, along with your greeting and a (free) horsey card.